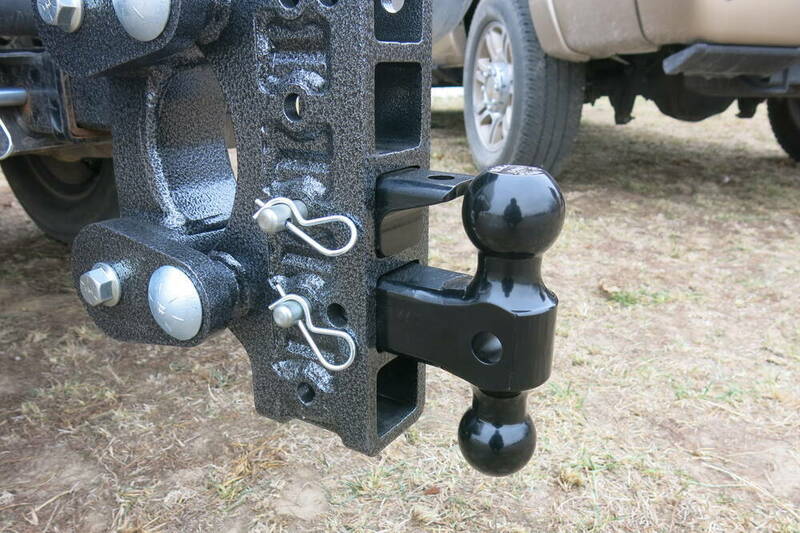 Insert this shock-absorbing, adjustable mount into your hitch to get 4 stacked 2" receivers. Flexing rubber cords limit shock. Tongue weight scale shows if the load needs to be adjusted. 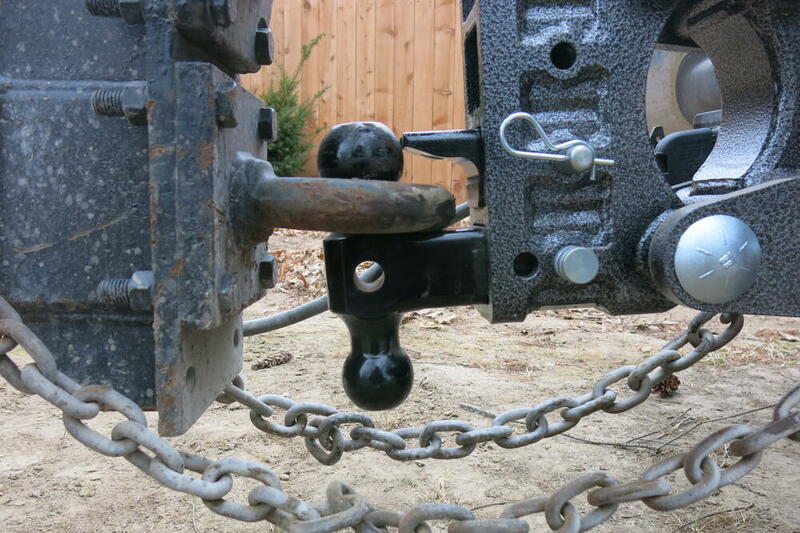 2" Ball, 2-5/16" ball, and pintle hook included. 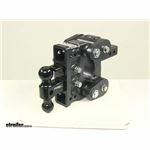 Call 800-298-8924 to order Gen-Y Hitch ball mounts part number 325-GH-1224 or order online at etrailer.com. Free expert support on all Gen-Y Hitch products. 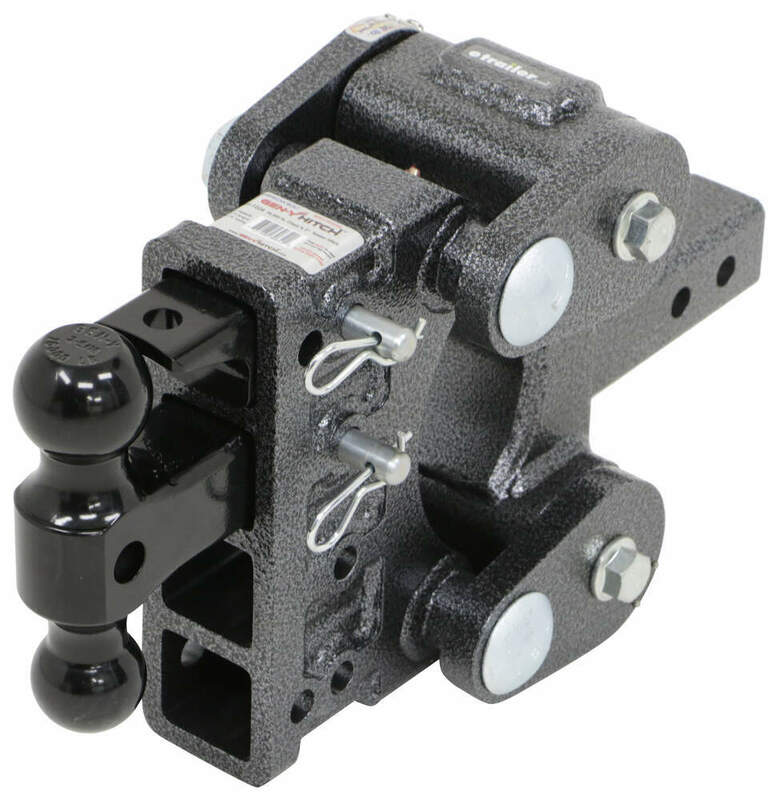 Guaranteed Lowest Price and Fastest Shipping for Gen-Y Torsion 2-Ball Mount w/ Stacked Receivers - 2" Hitch - 5" Drop/Rise - 16K. Ball Mounts reviews from real customers. 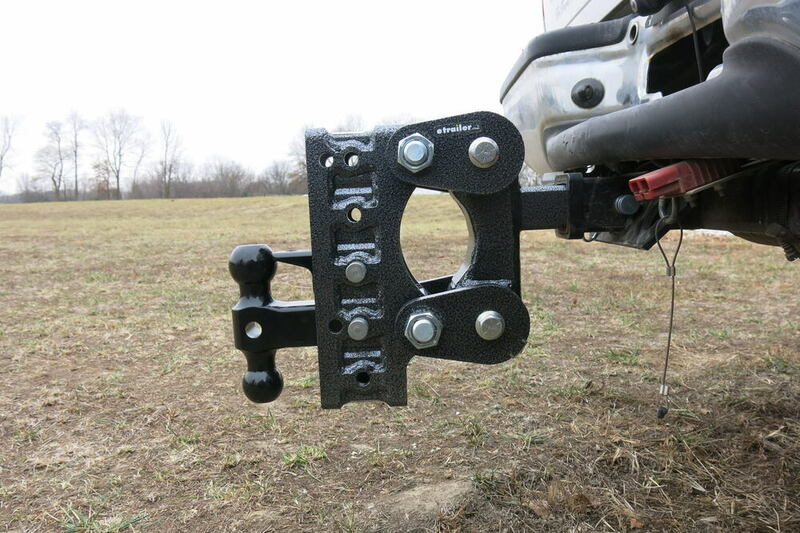 Insert this shock-absorbing, adjustable mount into your hitch to get 4 stacked 2" receivers. Flexing rubber cords limit shock. Tongue weight scale shows if the load needs to be adjusted. 2" Ball, 2-5/16" ball, and pintle hook included. 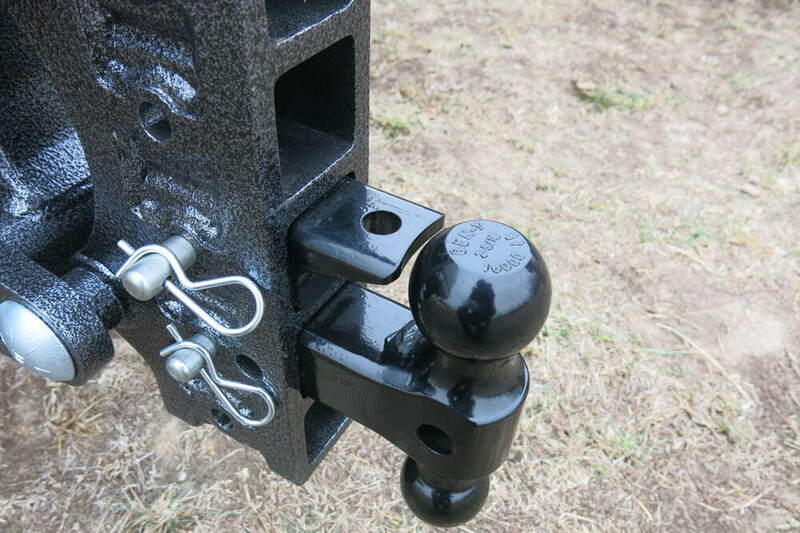 Built-in receiver size: 2" x 2"
Hitch pin hole diameter: 5/8"
Accessory pin hole diameter: 5/8"
This unique adjustable ball mount from Gen-Y Hitch has a vertical shank that is made up of 4 stacked 2" receivers that can accept almost any hitch-mounted accessory. This lets you easily adjust the height of the included ball mount, or any other accessory you choose to use. 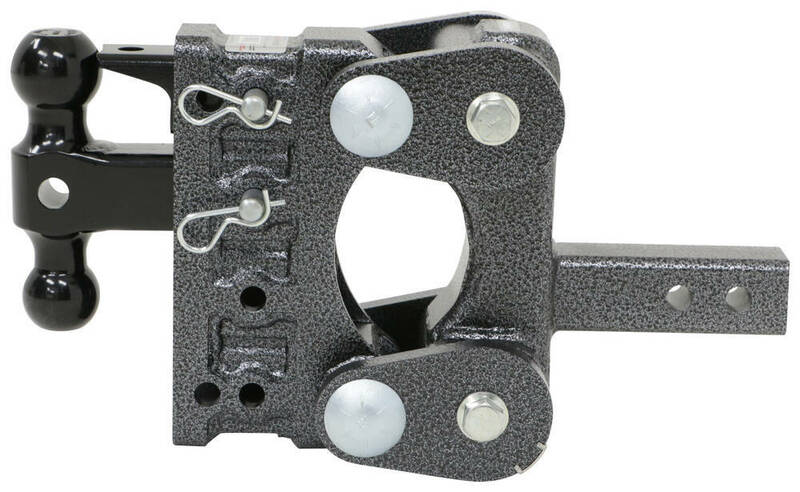 This mount also has built-in shock absorption to ensure a safe, smooth towing experience. Using technology similar to that found in torsion trailer axles, the Gen-Y mount absorbs road shock, isolating any rough jarring or chucking at the connection point. This prevents the rough motion from transferring from the vehicle to the trailer and vice versa. Driving over bumps, potholes, and uneven terrain causes road shock, which can result in a rough, bumpy ride and even potentially damage your vehicle or trailer. 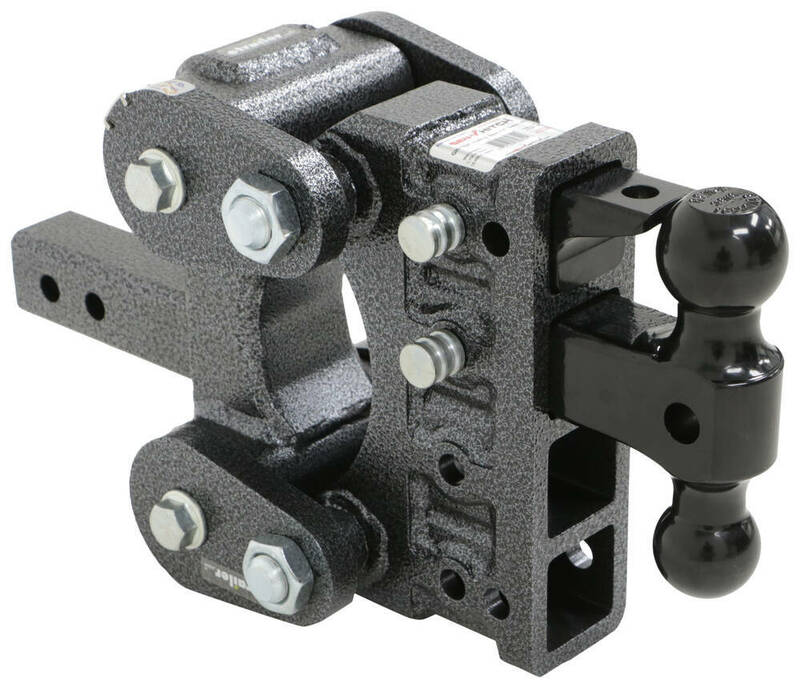 This Gen-Y Hitch torsion mount is designed to absorb road shock at the connection point to create a safe, smooth ride. This is thanks to the internal construction of the mount, which is similar to that of a torsion axle. Pivot points are built into the Gen-Y mount. 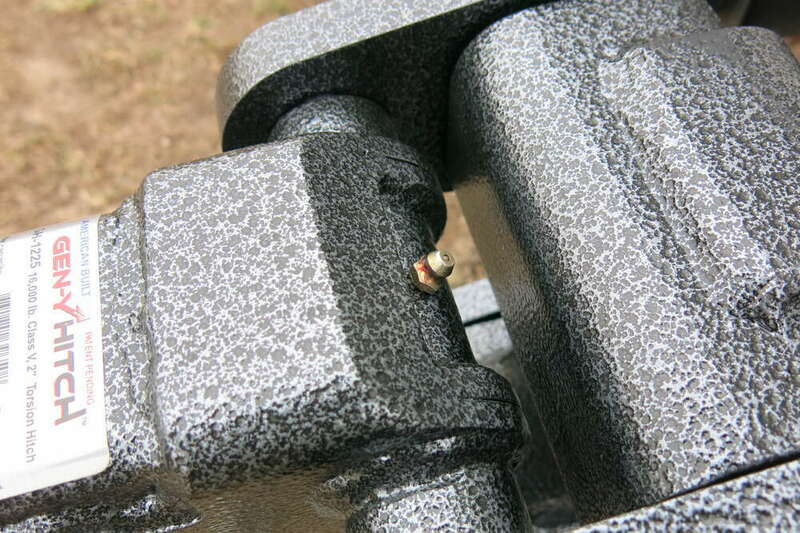 This allows for movement between the base, which slides into your vehicle's trailer hitch, and the stacked receivers, which provide the connection point for your trailer. 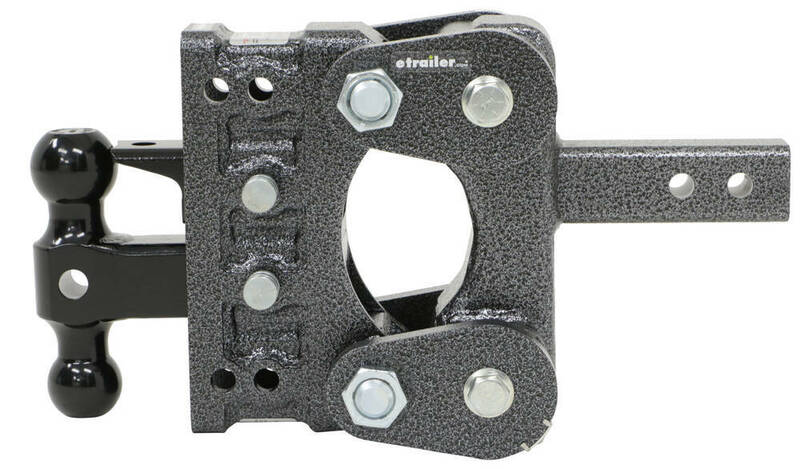 When your trailer hits a bump, the stacked receiver portion of the mount will move up or down accordingly. Built into the Gen-Y mount are tubes with inner bars that are surrounded by rubber cords. As the receivers rise or fall, these inner bars twist inside of the tubes, attempting to follow the receivers' motion. But the rubber cords prevent the bars from twisting too far. And as each bar turns, these cords compress to absorb the shock. This means that any shock experienced by your truck can be absorbed before it reaches your trailer, and the shock experienced by your trailer won't get transferred to your truck. This type of shock-absorption system is easy to maintain. Just regularly apply grease to the built-in zerk to keep the components in working condition. No airbags to fill. No small parts to repair or replace. No hassle. 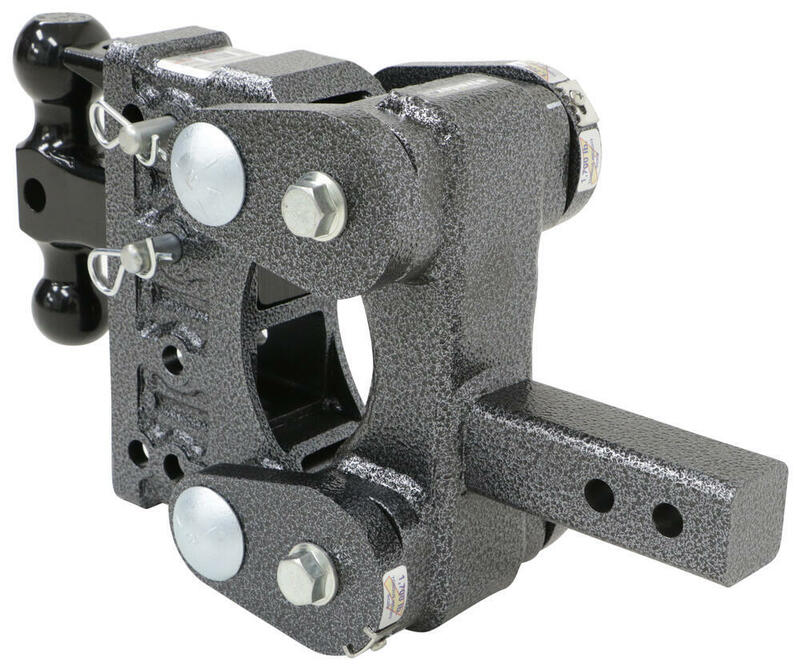 This unique mount from Gen-Y Hitch includes a ball mount that can be easily positioned in one of the 4 stacked receivers that sits along the vertical shank of the unit. 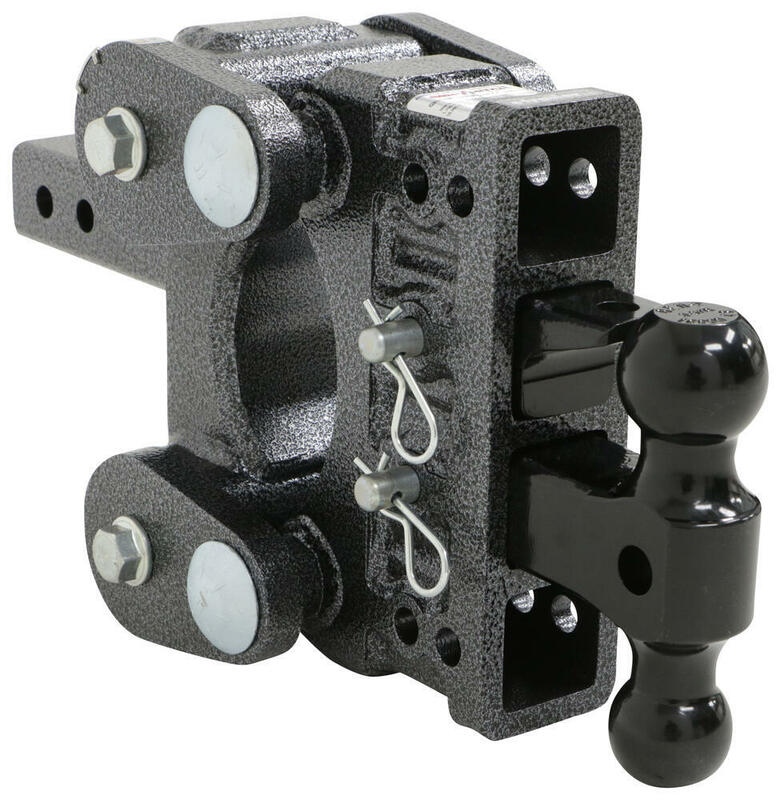 This dual-ball mount lets you tow a trailer with a 2" ball coupler or a 2-5/16" ball coupler. 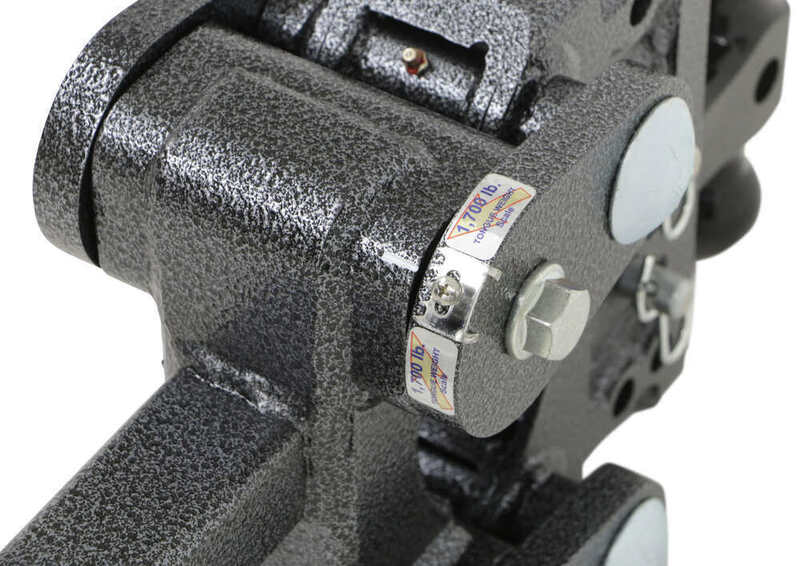 Also included is a pintle lock, which can be inserted into the receiver directly above the ball mount to create a pintle hitch for hooking up a trailer with a lunette ring. 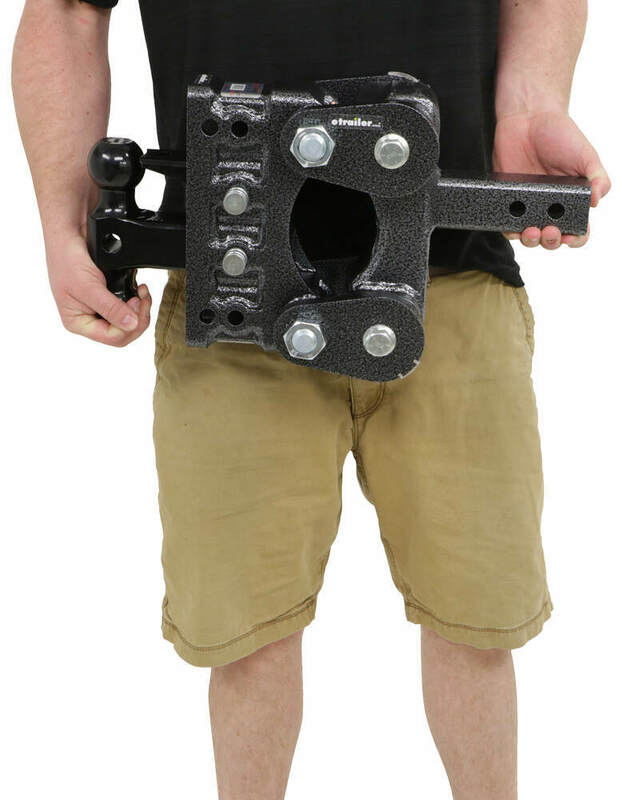 Unlike other adjustable pintle hooks on the market, there are no nuts and bolts to remove and retorque when you change the positioning of this hitch. Just move the ball mount and pintle lock up or down to get the proper height and secure them in place with the included pins. 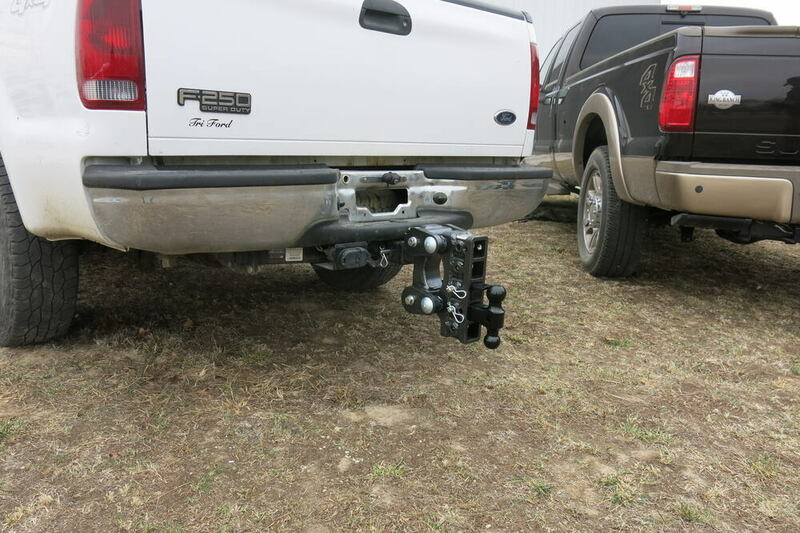 With the 4 stacked receivers, not only do you have the ability to adjust the height of the included ball mount, but you also have the ability to add various other hitch-mounted accessories. Insert a bike rack or cargo carrier. Mount a spare tire carrier. Use a tow bar to flat tow your vehicle. Or just add a fun hitch cover. This mount features a built-in mechanical tongue weight scale. The highest arrow on the scale indicates the mount's maximum tongue weight (1,700 lbs). The lowest arrow indicates no tongue weight (0 lbs). There must be a minimum tongue weight of 1,200 lbs for the built-in shock absorption to function. This means that the tongue weight scale's white indicator marker should be between the highest arrow and the middle arrow when you hook up your trailer to tow. 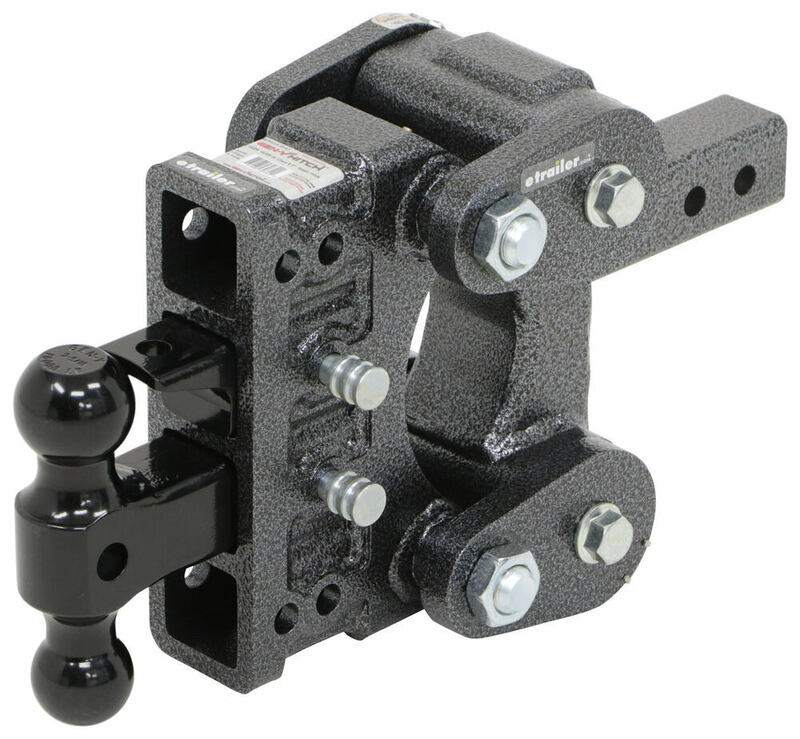 Insert this heavy-duty mount into your 2" hitch to get 4 stacked 2" receivers for mounting the included 2" ball, 2-5/16" ball, pintle hook, or other hitch-mounted accessory. Speaker 1: Today we're taking a look at a Gen-Y torsion adjustable receiver with ball mount for two inch hitches. So this unit is designed to fit into a two inch by two inch trailer hitch. Features a 16,000 pound towing capacity and a 1,700 pound tongue weight capacity. The unit really is built to last forever. It can be used in the drop or rise positions and provides up to a five inch rise or drop and a 2-1/2 inch rise or drop at the same time. So this is the point that slides into the hatch and you can see here that we have a slot that sits above that, so that's where we get our 2-1/2 inch rise or drop. And then we have three other slots, which will provide up to a five inch rise or drop. 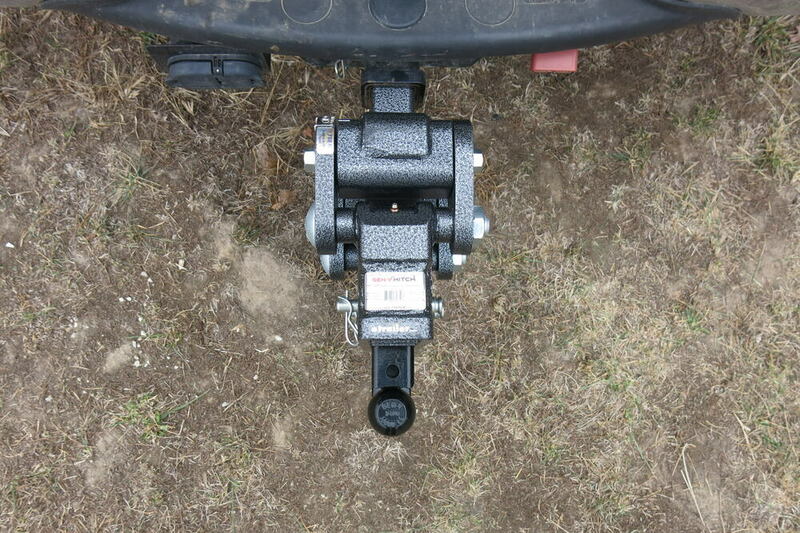 So no matter how you have it oriented in your hitch, rise or drop position, you're always going to have up to a five inch rise or drop and a 2-1/2 inch rise or drop at the same time.It does have four slots on the unit, so four adjustable positions. Allows you to move this ball mount around in there, so that way you can ensure that you're level when you're towing. Also the four slots can fit two inch attachments. That you can use other two inch hitch accessories with this mount. 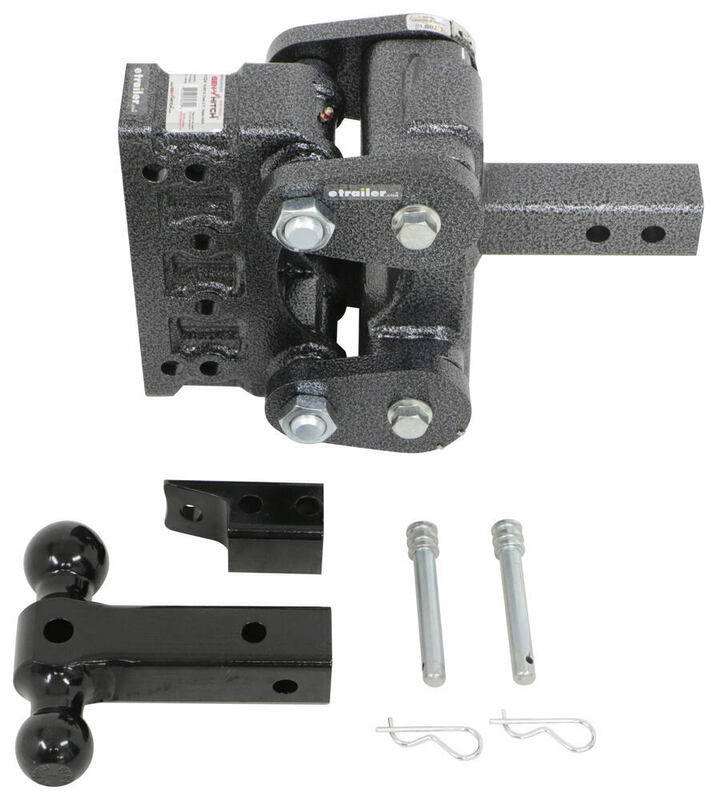 It does come with a versa ball mount, which includes a two inch and a 2-5/16 inch hitch ball. It's going to allow you to tow trailers with different coupler sizes. 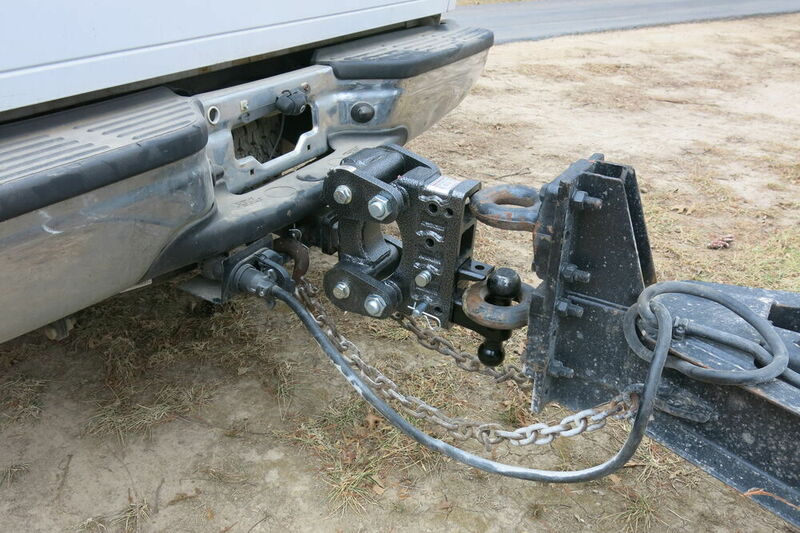 Also comes with a pintle lock so that way you can tow trailers that also have a lunette ring. 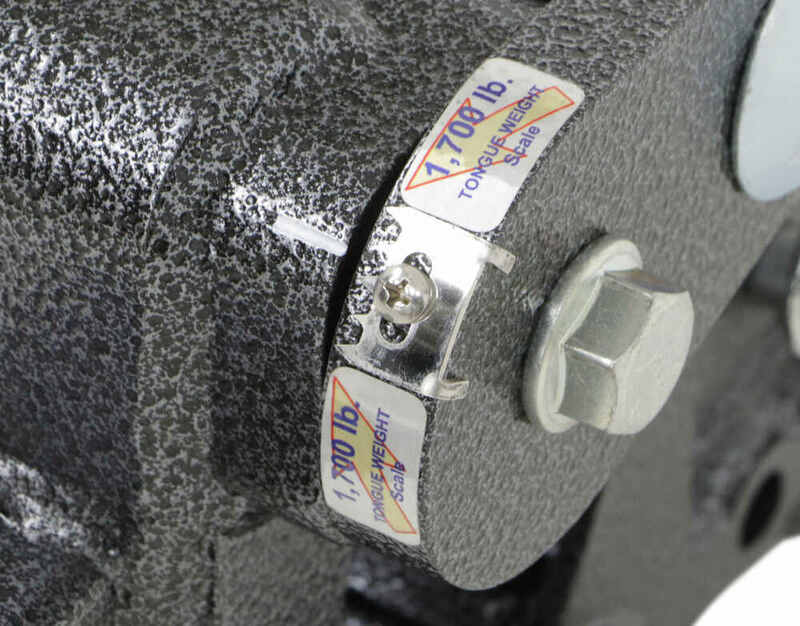 Now when using the pintle lock that's only to be used in conjunction with the 2-5/16 inch hitch ball.Making adjustments is very quick and easy. So with that pintle lock you have two pinholes on that attachment. So you have the in use position. This would secure the lunette ring or you have the stowed position. 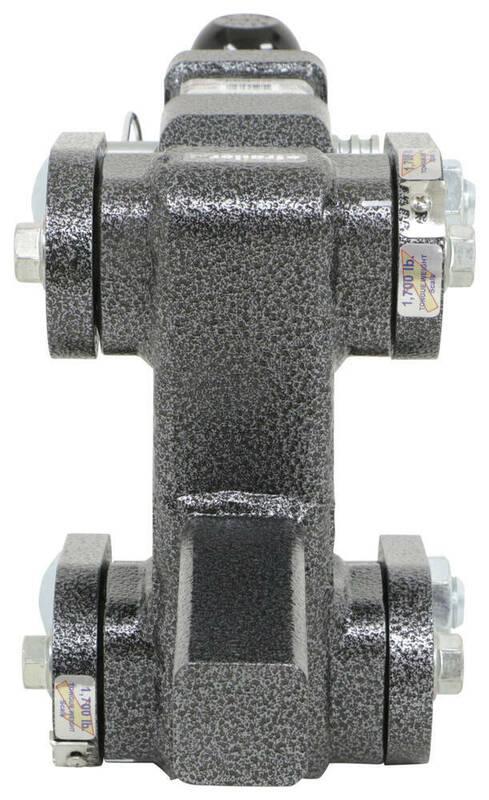 This would allow you to connect to the lunette ring and it also allows you to connect to a standard coupler and it keeps that pintle lock out of the way. You could also remove the pintle lock completely from the unit if you don't want it in there at all. And then when it comes to the versa ball mount, that's easy to operate as well. So you can take this out and slide it into any one of the slots that you need for your application. You can flip it over to switch between the two differently sized hitch balls. And then once you find the slot you need, push it back in, line up the pin holes and secure it with the included pin and clip.Now also with this unit, I do want to point out that it comes with an anti rattle screw. This can be tightened against the shank of your accessory to reduce movement from within the slot, and there is a threaded attachment point on each slot so you can move that around if needed. Basically I have it loose right now and you can see just by barely moving that ball mount, we have quite a bit of play from within that receiver slot. So what we can do is we can take a adjustable wrench, place it on there, and we can just go ahead and tighten that down. And that's going to really help reduce the amount of play from within that slot. So you can see there, I'm trying to move it around with the same amount of effort that I was earlier and I'm not get any movement from within that slot. So that's going to drastically help reduce that movement, which is going to result in a much quieter ride as we head down the road.Now you'll notice that with this mount we have a lot going on back here. 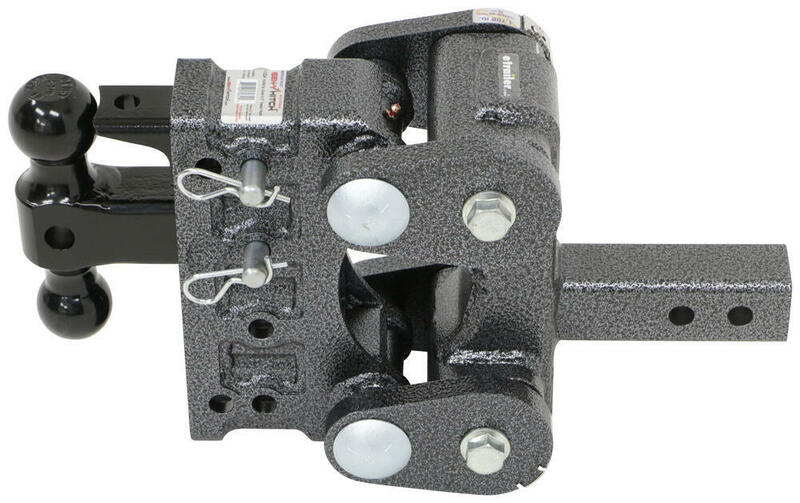 That's because this is a torsion hitch and it has a lot of great features. 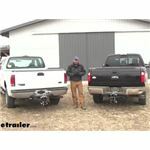 So with a rubber torsion hitch, only about 10% of the trailer movement or inertia transfers compared to 100% when using a standard hitch. So internally, there's actually small torsion axles. There's heavy duty rubber torsion flex cords, which eliminate shock transfer. 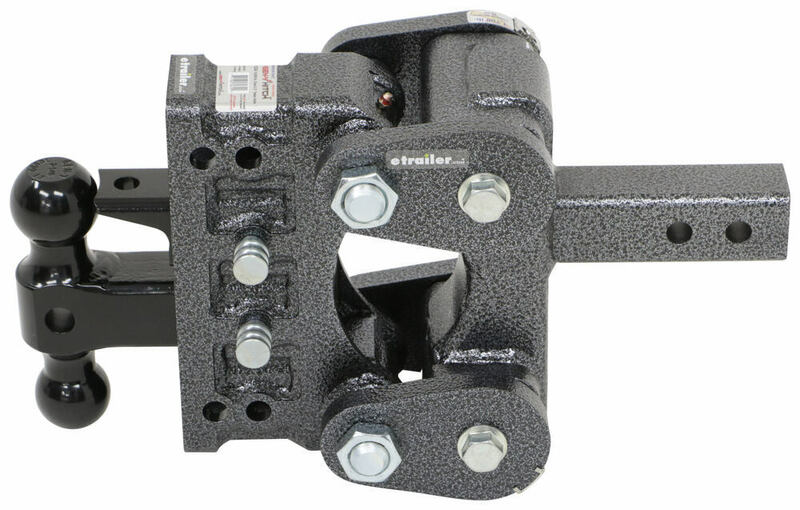 So with this unit, it's designed to allow your towed vehicle and your trailer to track independently, which is going to give you greater control and added safety by reducing sway and trailer balance. So that torsion design absorbs the movement. So if you have this connected to your trailer and your trailer's bouncing, basically this portion here is the only part of the unit that's doing the up and down movement. Now you might feel a little bit of movement, but this does drastically reduce the amount of movement that you'll feel as you're driving or as you're in the towed vehicle.It's a really nice design. Braking control increases since all the weight on the tow vehicle and trailer is distributed evenly. It's going to really help give increased positive contact when braking and maneuvering. The system helps keep you under control when confronted with road conditions, such as bumps, potholes, expansion joints, curbs, hills, and so on. It is rated to have a 90% smoother ride. It reduces driver fatigue and it also reduces trailer fatigue, which helps protect your trailer and whatever it is that you're hauling. Now the unit itself is fabricated with heavy duty steel. It's precision milled and drilled for a perfect look and fit. It also as protective powder coating that keeps it safe from rust and corrosion. And it features a low maintenance design, so there's no airbags or bearings. Basically on this unit, there's just two grease servers. There's one right here and one located at the same point on the opposite side. So you can attach a grease gun, pump in the grease to keep those moving components lubricated as needed. It does come pre-lubed, so it's ready for use right out of the box.It does also feature a mechanical tongue weight scale, which promotes balanced, safe loading. So this allows you visually to see the tongue weight amount and adjust your load as needed. And with this mount for an optimal ride, you want between 1,200 and 1,700 pounds of vertical load or tongue weight.A few measurements to go over with you real quick. You'll notice that it has two pin holes on the shank here. You can choose whatever one works best for your application. 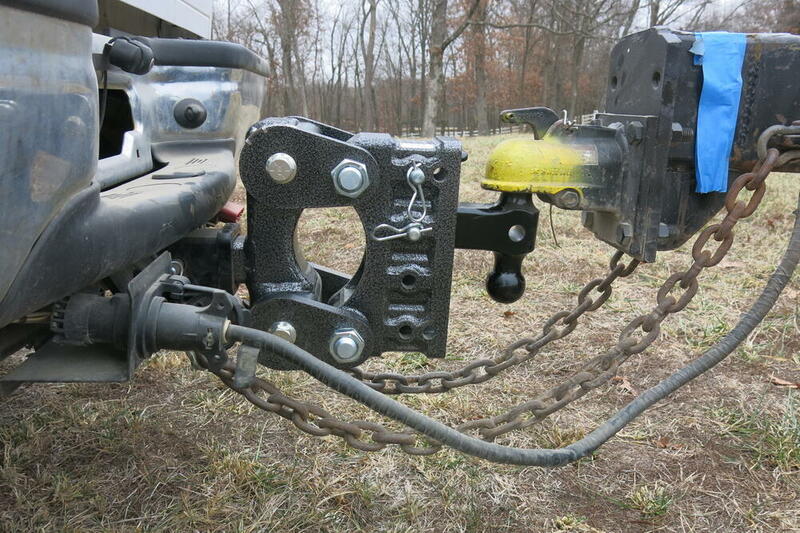 From the center of this one to the center of the hitch ball, there's about 15-3/4 inches. From the center of this one to the center of the hitch ball is about 17-1/4 inches. Also, when you're using this in the rise position, you want to make sure you have enough clearance at the back of the vehicle. So from the center of this pinhole to the back of the upright is about 3-1/4. From the center of this one to that same point is about 4-3/4 inches.This product is made in the USA. It has a 10 year warranty on all the moving parts and a lifetime guarantee on the rest of the moving . Excuse me, on the rest of the components. So 10 year on moving parts, lifetime on the rest of the unit. That's going to do it for today's look at the Gen-Y torsion adjustable receiver with ball mount for two inch hitches. 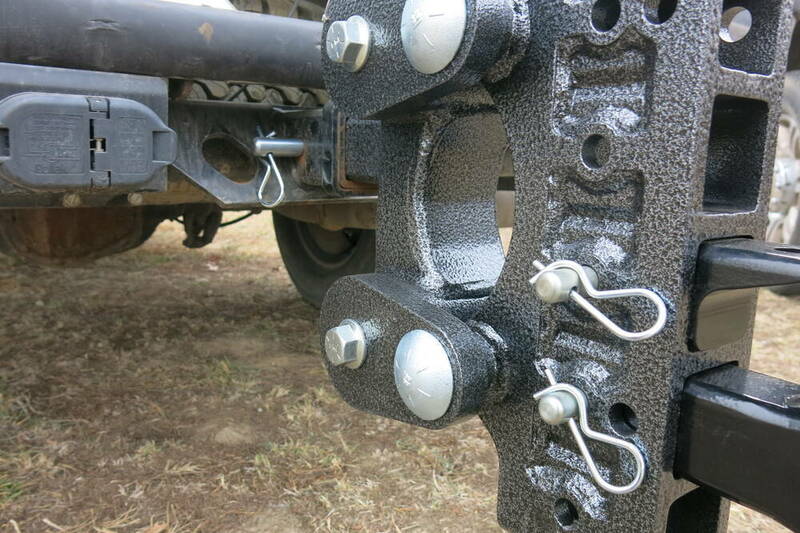 Order: RelevanceNewestRating - High to LowRating - Low to High Insert this shock-absorbing, adjustable mount into your hitch to get 4 stacked 2" receivers. Flexing rubber cords limit shock. Tongue weight scale shows if the load needs to be adjusted. 2" Ball, 2-5/16" ball, and pintle hook included. Gen-Y Weight Distribution System for Different Tongue Weights and Compatibility with Torsion Hitch? 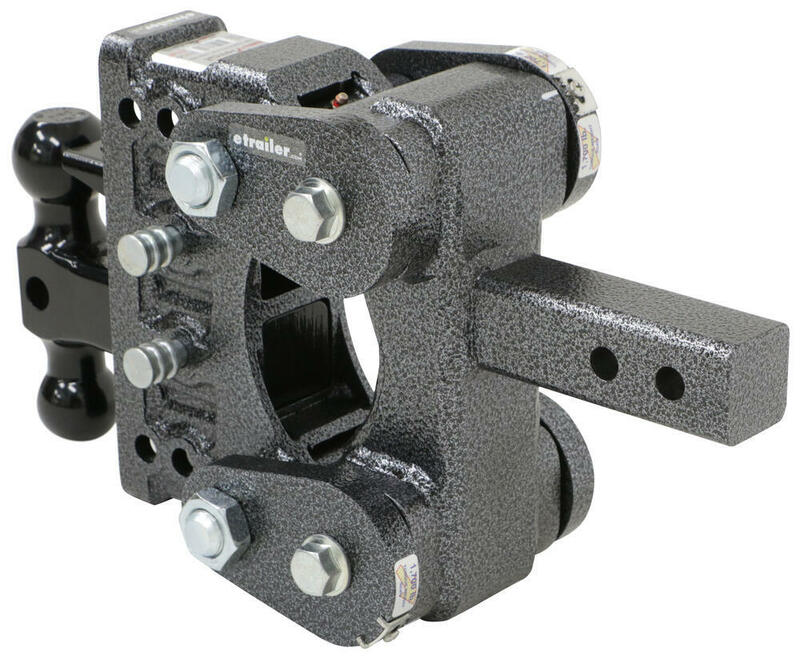 The Gen-Y Torsion 2-Ball Mount w/ Stacked Receivers - 2" Hitch # 325-GH-1224 that you referenced weighs 84 lbs. I'd recommend getting help to install it if that's too much weight for you to lift without over straining.